RB Vick Ballard, Mississippi State; RB Brandon Bolden, Mississippi, QB Greg McElroy, Alabama; RB Tauren Poole, Tennessee; C William Vlachos, Alabama; LB Jonathan Cornell, Mississippi; S Zac Etheridge, Auburn. A.J. Green. Obviously, if you’re a Georgia fan, his second-team finish is what catches your eye there. I can see both sides of the argument to some extent. Green only played in eight games, not enough to qualify to appear in the official SEC stats. And being fair, there are a lot of very good receivers in the conference this year who did play in more games. On the other hand, his numbers match up very well against the elite: his receptions per game rank third (tied with Jeffrery), his yards per game rank second (behind Jeffery and ahead of Jones) and his touchdowns tie for first (despite playing in four or five games less than the others). There’s also the matter how how dramatically Georgia’s scoring increased after Green was inserted back into the lineup. But the clincher for me was how much opposing defenses altered their schemes and coverages to account for his presence on the field. I never saw another receiver affect SEC defenses in that way this season. I would have voted him first team with Jeffery. Receivers. On a related note, no other receivers in the league got honorable mention? I’m kind of surprised that Darvin Adams or one of the Arkansas wide outs didn’t get a few votes somewhere. Aaron Murray. No way I’m suggesting that there’s something wrong with the first or second-team picks, but if Greg McElroy made HM, Murray was just as deserving, especially considering that he was without his best receiver for the first four games of the year. Nice job coaching them up. Florida had no first teamers on offense and no second teamers on defense. What happened with all those top recruits, Corch? The center position. Speaking of which, Mike Pouncey on the second team? I was under the impression that being able to snap the ball to the quarterback on a consistent basis was important. Is the conference that lacking in decent center play? Sentimental picks. I’d have gone with Jasper at kicker just because of the play against Florida. And Chris White’s certainly earned a special place in my heart. Injustices. Casey Hayward and Janoris Jenkins should exchange places. Mississippi State finished the year second in rushing and fourth in sacks allowed; some lineman in addition to Sherrod (who had a fantastic year) should have at least gotten a nod at honorable mention. Cornell should have placed ahead of Bynes and Hightower. UPDATE: Coaches’ picks are here. One positive over the AP’s is that Pouncey is nowhere to be seen. On the other hand, Gilmore as a first-teamer is a bit of a stretch. He may have been the most inconsistent big name DB I saw this year. You gotta like the Orson Charles love, though. More proof that America is a great country. With Cam Newton and LaMichael James making the short list for this year’s Heisman Trophy, perhaps it’s time to reexamine the issue of how a player emerging from an alley is a sign of a program that’s out of control. Bill Connelly takes a look at how teams rank at running up the score. Georgia’s place on his list might surprise you. Dan Wetzel hates the BCS. I mean, hates the BCS. He’s been pushing a 16-team playoff in his book about hating the BCS and he’s unveiled the field that would exist under his version of a D-1 postseason. I have an idea. Why don’t we let the #1 team in the country play Akron (currently #209 in Sagarin’s rankings, the lowest rated team in D-1) in the first round of a tourney? That would really make the regular season matter, wouldn’t it? FIU started out the season playing four BCS-conference schools. It lost to all four, including a horrid Rutgers team which it faced at home. I have news for Wetzel – any playoff format that has room for a team which boasts as its best win a 17-point victory over Troy is making a joke out of the regular season. 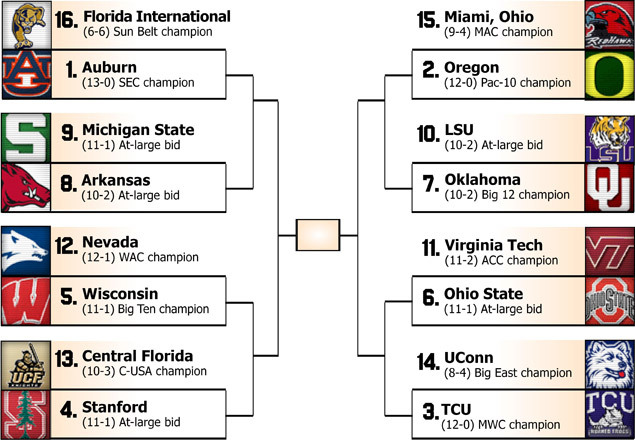 Setting up a 12-team format that gives Auburn an actual bye makes more friggin’ sense than that. Back to the drawing board, son. No, the BCS didn’t “work.” To be more accurate, the BCS wasn’t necessary. For it to “work,” it would’ve actually had to do something useful. My sister thinks Auburn is the shade of Nice ‘n Easy she used five tries ago in a yet another failed attempt to look 25, and even she could’ve figured out that the two unbeaten BCS teams should play for the national title. You don’t need a cockamamie BCS system, some bizarre computer formulas (which, by the way, had a few major inconsistencies), and a bunch of money-grubbing bowl executives to figure out that there’s no real argument against the Ducks vs. the Tigers in the BCS Championship. Twenty years ago, Oregon would have played in the Rose Bowl. Auburn would have appeared in the Sugar Bowl. And Fiutak would be bitching about how the system failed miserably in producing a national title game. Maybe I’m missing something here, but to me, this year’s title game would fall under the definition of “works”. I get that the BCS has its flaws. Is it too much to ask of its critics that they not insult our intelligence when they complain about it? UPDATE: Michael Elkon schools Wetzel on what “relevancy of the regular season” means.